This AC Adapter power cord is what you need if you have lost your NES' power cord! NEW AC Adapter Power Cord for NES Console. Nintendo Power Cord NES Original AC Adapter Cable Authentic OEM and Controller. Official Original Super Nintendo Power Supply OEM AC Adapter SNES Power Cord. Condition is Used. Tested and works perfect. 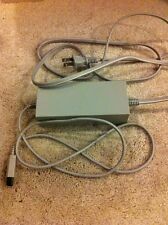 Nintendo NES Power Cord Original OEM NES Part AC Adapter MODEL NO. NES-002 WORKS. Condition is Used. Shipped with USPS Priority Mail Padded Flat Rate Envelope. Condition is Used. Te st ed a nd w or ks. Trending at $15.47eBay determines this price through a machine learned model of the product's sale prices within the last 90 days. Genuine Original Nintendo Wii AC Power Adapter w/ Power Cord RVL-002 D1. Condition is Used. Shipped with USPS Priority Mail. This is an Official OEM Nintendo N64 Power adapter plus an original N64 AV cable sold together for one price. They are both in good used condition. Original NINTENDO GAMEBOY ADVANCE SP AC ADAPTER POWER CORD AGS-002. Condition is Used. Shipped with USPS First Class Package. Nintendo Brand Power Cord Nintendo Wii Brick Supply Original W/ Extras. Condition is Used. Shipped with USPS Priority Mail. Excellent condition. Tested and Works. Wii power cord and plug Original Nintendo product . Condition is Used. Shipped with USPS Parcel Select Ground. This was working before my Nintendo broke. Manufacturer: Nintendo. Am I Original Owner?. No cracks or splits. Original Cable. NO EXCEPTIONS! Price too High?. Or ig in al Nintendo NE S Po we r Co rd. Good workingcondition. Original Nintendo Gamecube Power Supply AC Adapter DOL-002 Official Power Cord. Condition is Used. Shipped with USPS First Class Package. Nintendo Wii. 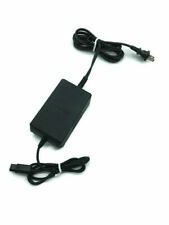 Power Cord AC Adapter. & A/V Cable. OEM Original. 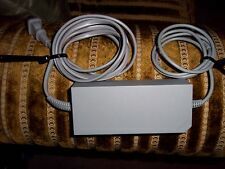 Nintendo Wii AC Power Adapter w/ Power Cord RVL-002. Midatlantic Jewelry & Pawn Inc.
AC Power Adapter Cord, AV Cord, Motion Sensor Bar, Base Stand. AV Audio Video Cables Model: RVL-009. Motion Sensor Bar Model: RVL-014. 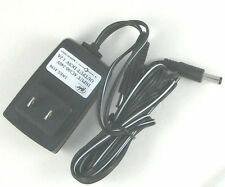 AC Power Adapter Cord Model: RVL-002(USA). Up for sale is a Original Nintendo AC Power Cord & Two Controllers. Everything is in good conditionwith minor scratches and dents. Cleaned and tested. Working. This is a used NES-002 Nintendo NES AC Adapter. Specifications for NES Power Cord. Input: AC120V, 60Hz, 17w Output: AC9V, 1.3A. Nintendo Wii Official Power Cord AV Cable Motion Sensor Bar Bundle OEM Original. Condition is Used. Shipped with USPS Priority Mail. 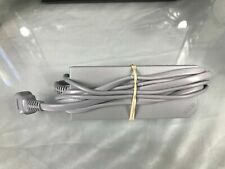 1 Nintendo NES Power Cord Original OEM NES Part AC Adapter MODEL NO. NES-002. Condition is Used. Shipped with USPS Priority Mail. 1 Sensor Bar (RVL-014). 1 Power Cord (RVL-002). Genuine OEM Wii Original Nintendo Wii AC Power Adapter w/ Power Cord RVL-002. Condition is Used. Shipped with USPS Priority Mail. This original Nintendo Wii AC adapter. This has been tested and works well. Shows normal wear. Wii Adapter and AV Cables. Pictures are of the exact item(s) you will receive. Nintendo Wii AC Adapter & AV Cable. Official Nintendo products. Check back regularly for new inventory. Tested and works. NES Power Brick or Power Cord. Good Pre-owned condition, Normal wear, Sold as pictured. Images are of the actual item. Super Nintendo Snes Power Cord / Power Brick.